Whether you’re a CEO or a student, it’s fairly common to hear complaints about balancing your commitments and goals. Between work, school, and personal life – busy schedules make most of us feel like there’s never enough time to get it all done. Work is part of life, but it doesn’t have to control the way you live. There needs to be a balance between the two that enables you to gain the most out of both. The issue is usually not in the realization that there is a problem or knowing that you should have a more balanced approach to your life… professionals get bogged down by developing a plan of action and then actually sticking to it. The tricky part of change is to develop a concise course of action and then implementing that action in a consistent manner. Visualize: If you’re struggling to find a healthy work-life balance, consider writing out an action plan to address the long-term goals you want to accomplish. Before you prepare your list, make sure every item is a S.M.A.R.T. goal – that is, Specific, Measurable, Attainable, Relevant, and Time-bound. A goal such as, “I want to be rich,” is not acceptable answer. “I want to own a yacht by the time I’m 50,” is slightly better. The best possible answers involve specific places, times and events that are realistic to achieve. Plan: Now that you’ve made your list of (realistic) hopes and dreams both on the work and the life side of the equation, it’s time to make some concessions. That’s right, you can’t have everything. Trade-offs are part of the deal – you can’t spend all day long with your kids, or writing your novel, or gardening – and expect one day be a hot-shot Wall Street lawyer. Extravagant career goals, life goals, and retirement goals all have their time and place in our imaginations, but SMART goals keep us in reality, and push us to achieve whats physically possible. Go through your list and ensure that your goals are grounded in a practical understanding of your own motivations. Implement: The final step is to start living in line with your goals. You know what you want, now go out and get it. Start making changes today, even if they seem minor. You can save the big hurdles for later when you’re ready to go all in. You have the guidelines in front of you, written out and re-evaluated – so make and take the the stepping stones you’ll need to achieve tomorrow’s success. Keep your steps small and credibly achievable. For example, if you want to develop a better relationship with your child, make a concrete, but small step – spend an extra 15 minutes talking after dinner. Too many professionals stop at the intangible, long-term goals and big plans; they never perform the small steps required to make the plan happen. 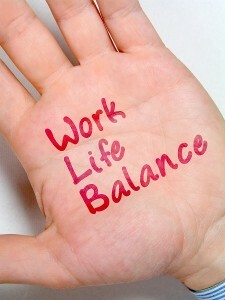 Do you notice how work life balance contrasts “work” with your “life” – as if they are two separate entities? For most of us, work is a big part of our life. We should perhaps adopt a new vernacular to fit a modern professional lifestyle: life, split between work and personal spheres. Work is inextricably interwoven into our lives, and we should instead look to improve our whole life instead of taking a bifurcated view of it as work and life. When planning and executing your work life balance plan, be sure to think of the whole first – how to raise the quality and happiness in your whole life, and map those into actionable goals under each personal and professional sphere. When you have your overall goals mapped out in detail, the specific visualization, planning, and implementation described above can be put into place.